Chia seeds are an ancient South American superfood from the plant Salvia hispanica - a flowering plant from the mint family. Their very subtle nutty taste allows you to add chia seeds to absolutely anything that you eat or drink - helping to boost your nutritional antioxidants and Omega 3 intake. Drink: Add a teaspoon of Chia seeds to a glass of water or juice before drinking. Or add Chia seeds to your fruit smoothies for a natural antioxidant boost. Sprinkle: Sprinkle Chia seeds on salads, cereals, yoghurt, even soup. Or add a sprinkling in your baking - great in bread, cakes cookies and biscuits. Soak: A common way to consume Chia seeds is to soak them. Make basic Chia gel by adding 1/3 cup of seeds to 2 cups of water. Stir, leave for around 10 minutes until it takes a gel-like consistency. Soak the chia seed for 5 minutes in the liquid. Add the sliced fruit, hempseed and honey and enjoy!!! 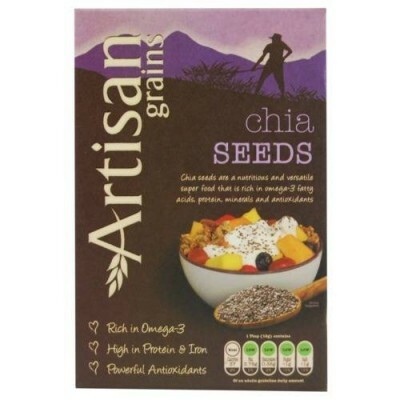 Click the button below to add the Artisan Grains Chia Seeds 125g to your wish list. All prices are in GBP. Copyright 2019 Beneficial Health . Sitemap | If you have a particular health condition or concern, please first visit a health professional (a GP or a qualified practitioner) to ensure you have correct diagnosis. Often with chronic health conditions, the health food store will give excellent advice for dietary and lifestyle modifications, a supplement programme and possibly assistance from topical products.